Fried wonton strips were a mainstay at the Chinese restaurants I frequented growing up in Connecticut. When I moved to California, I was saddened to find that the complementary little wax paper bags filled with these crisp, greasy snacks — and the accompanying packets of duck sauce — were absent from my takeout orders. And when fried wontons were listed on the menu, they were the filled kind, so not the same! Thankfully, after making the five spice chicken-lemongrass dumplings, I was armed with a stack of leftover wrappers, but not quite enough to make another batch of dumplings (possibly because I got tired of rolling out wrappers toward the end…). Cue: gluten-free wonton strips. It takes hardly any time to fry up a bowlful of these crisp, puffy snacks, and while quite plain-tasting on their own, they are simply meant for plum (aka duck) sauce, and are the perfect treat to whet your appetite for some homemade Chinese takeout classics! I’ve only tested this recipe with very thinly rolled out (#4 on a pasta roller) dumpling wrappers. Thicker or hand-rolled wrappers may yield a less crisp and puffy result. Heat about 2″ oil in a small pot over medium heat. Once oil reaches about 350°F – 375°F, carefully-yet-quickly drop about 1 – 2 dumpling wrapper’s worth of strips into the oil. 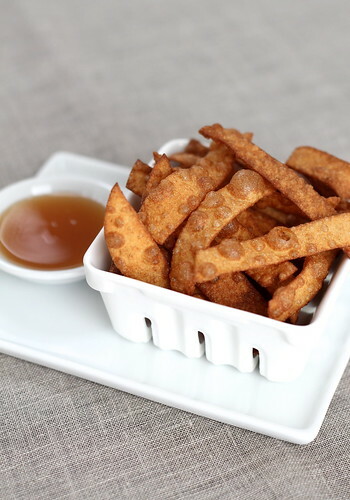 Fry strips until golden brown on all sides (30 seconds – 1 minute), using a mesh skimmer or slotted spoon to turn half way through. Use skimmer to remove wontons to a paper towel-lined plate to drain. Repeat with remaining strips. Once drained and cool, serve with plum/duck sauce for dipping!